The whole energy food and drink phenomenon is a total anomaly to me. On the one hand we’ve got jillions of kids out there being diagnosed with ADHD, and we do everything we can to calm them down. Then once all these hyperactive kids grow up, we dose them up with No-Doze, cans of Red Bull, and candy like the Maxxed Energy Pop. Is it only me who sees the problem with this? I seem to recall getting high enough on the amount of sugar in candy like Blow Pops, without the lovely people from Charms feeling like they needed to add more stuff. These enormous lollipops are packed with loads of somewhat questionable stuff – taurine, ginseng, guarana, b-vitamins, caffeine. Sadly, they forgot one essential thing on that list – flavor! These lollipops taste hideous! I actually kept it in my mouth for quite a while, hoping that somehow the taste would improve. 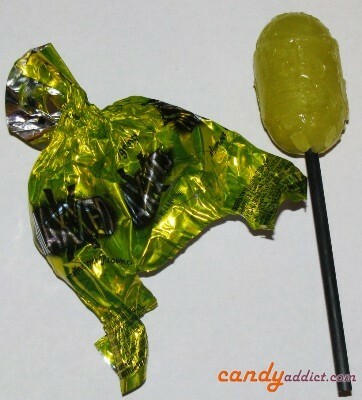 It didn’t, and I have no problem with saying that this lollipop is so nasty, it verges on the inedible. The texture is incredibly like sandpaper and the size is so huge as to appear almost obscene. The marketing campaign for this is pretty funny – they say that the lollipop “almost glow[sic] neon yellow.” I know I’m always looking for food with a radioactive tint. Not. They also claim that the Maxxed Energy Pop has “…a unique flavor blend, with cream soda notes and hints of lemon lime, making it better tasting than the average energy drink.” I don’t know about you, but my average energy drink doesn’t make me want to hurl. This lollipop does. In the interest of fair play, I actually let my family taste this lollipop. The kids loved it – “Mmm! Lime!” and the husband thought it scored an “ehhh.” Me? I let it sit for a while and then tasted it again just to be sure… it’s still Maxx-imum disgusting. I actually agree more with your kids on this one. I am going to assume you are not a fan of energy drinks because I actually find the flavor comparable to your average energy drink. While I will agree that the texture is a bit like a cat’s tongue and this pop is will probably fade away along with the whole energy craze, I still find it a flavorful pick-me-up to get me through the back half of my day. My only complaint is that you cannot mix it with vodka like you can a redbull. I tried one of these after picking it up at a convenience store the other day while I was getting gas. Scrape-y, terrible tasting, and i think it made my mouth bleed a little when I tried my usual lollipop-twirling. On top of that, I felt nothing from it. Ha-ha-ha-ha-ha-ha-ha-haaaaaa! This review made me laugh more than any other in a long time…THANK YOU, Michelle! That lloks radioactivelly good and dangerous….